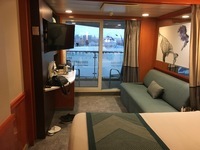 We have sailed with NCL and other cruise lines and we felt that on this cruise the service and the quality of the food was definitely declining. The food in the Garden Cafe was not well displayed and the way the cafe is laid out makes it very difficult to get to the buffet. There was limited seating and it was incredibly noisy - we avoided the Cafe as much as possible and ate in O&apos;Sheehan&apos;s which was easy to get into and quiet enough to carry on a conversation, but the menu is quite limited. We ate in the main dining room, Versaille a few evenings and mornings for breakfast and the service was just terrible - our food never came at the same time, sometimes it was cold and sometimes items were missing. The menu was also not very appealing - not once was steak and lobster on the menu. We ate at the speciality dining restaurants 3 nights and they were all excellent. As for the bars - they were always understaffed so we had to stand at the bar to order our drinks and usually there was only one bartender so it took a long time just to get a glass of wine. We typically met in Gatsby&apos;s. The couple we were traveling with were in a cabin that had a faulty toilet and for the entire 8 day trip they had to call Guest Services to have a plumber come fix the toilet and then wait for housekeeping to come clean up the water all over the bathroom floor! Literally everyday, and sometimes twice a day they spent time in their cabin waiting for a plumber I&apos;m pretty sure none of us will travel on the Star again. The itinerary was spectacular even though we missed a stop in Kotor - our captain said the weather was too bad to get into the port. However when we spoke to our tour guide abou canceling our planned tour he said our Captain made a big mistake because the weather was beautiful. Very disappointing. I&apos;m all about safety, but I felt they skipped this stop out of convenience to the ship, not because of weather. We have sailed with NCL and other cruise lines and we felt that on this cruise the service and the quality of the food was definitely declining. The food in the Garden Cafe was not well displayed and the way the cafe is laid out makes it very difficult to get to the buffet. There was limited seating and it was incredibly noisy - we avoided the Cafe as much as possible and ate in O&apos;Sheehan&apos;s which was easy to get into and quiet enough to carry on a conversation, but the menu is quite limited. We ate in the main dining room, Versaille a few evenings and mornings for breakfast and the service was just terrible - our food never came at the same time, sometimes it was cold and sometimes items were missing. The menu was also not very appealing - not once was steak and lobster on the menu. We ate at the speciality dining restaurants 3 nights and they were all excellent. As for the bars - they were always understaffed so we had to stand at the bar to order our drinks and usually there was only one bartender so it took a long time just to get a glass of wine. We typically met in Gatsby&apos;s.
I&apos;m pretty sure none of us will travel on the Star again. The itinerary was spectacular even though we missed a stop in Kotor - our captain said the weather was too bad to get into the port. However when we spoke to our tour guide abou canceling our planned tour he said our Captain made a big mistake because the weather was beautiful. Very disappointing. I&apos;m all about safety, but I felt they skipped this stop out of convenience to the ship, not because of weather. The cabin was very nice. Although it would be most helpful to have a light in the closet, it was so dark it was impossible to see anything we put in the shelves or in the safe. I enjoyed the mini-suite but did not need a bathtub - it would have been nicer to have a step in shower. We booked our own tour with Michael&apos;s and it was fantastic. We booked our own tour with a Cruise Critic group - it was okay. We visited Pompeii but spent too much time there, Next stop was Sorrento but it was raining and where we stopped was so far from anything the only thing we had time for was lunch in a small restaurant that the driver must have wanted us to use. The food was good and the service was excellent but we did not get to see much of Sorrento. Never made it to Positano. We won&apos;t use Cruise Critic tours anymore, we do better booking our own tour for just the four of us. We stayed at the Hilton at the Fumancio airport which has a free shuttle into the city, then jumped on the hop off hop on bus for a couple of hours - that was all the time we really had. Venice was excellent, we used the vaporettos to get around just fine. We left the morning of the big flood - so we got out just in time. Only cruise I had to clean my own Mini suite ever! Enjoyed my time aboard the Star! Staff steered us wrong multiple times.